Here’s Where You Can Get Free Food On Tax Day! If you haven’t sent in your taxes yet, you still have until tomorrow, and while most people in America hate Tax Day, there are some businesses that are doing what they can to bring a smile to people’s faces – with free food. Boston Market - Freestanding locations are offering a $10.40 Tax Day special, including a half chicken individual meal with two sides, cornbread and a regular fountain drink, while supplies last. California Tortilla – If you use the password “chipping in” you can get a free small order of chips and queso with the purchase of any other menu item. Chili’s – For those who need a drink after their taxes are done, Chili’s is offering $5 Cuervo Blue Margaritas. Chuck E. Cheese’s - On both tomorrow and Thursday, any large pizza you buy will get you another free large cheese pizza. 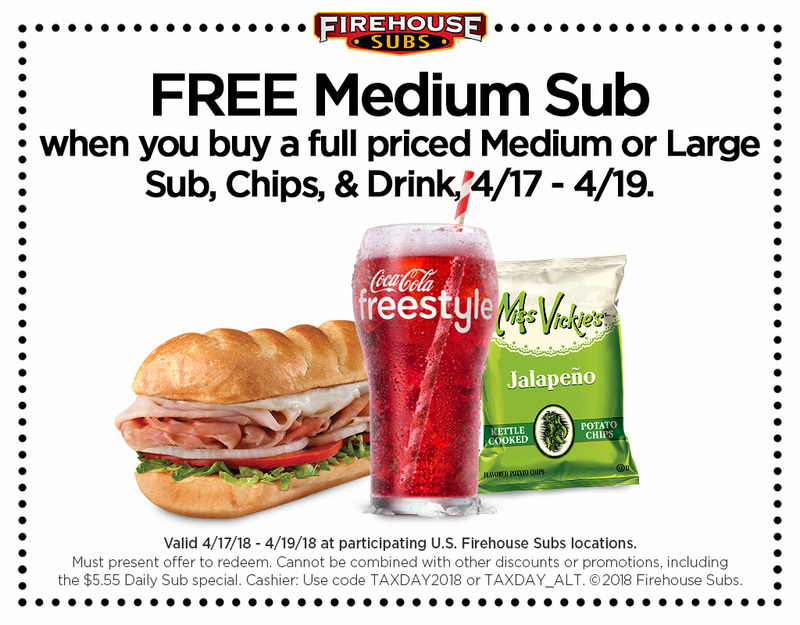 Firehouse Subs - From today through Thursday, folks can get a free medium sub with the purchase of any medium or large sub, chips, and a drink, using this coupon. Great American Cookies – You can snag a free Cookies & Cream cookie. Hardee’s – Between 7 and 10 am, if you say the password “Made From Scratch” you’ll get a free sausage biscuit. Hooters – While adults don’t get anything, kids can get a free Hooters Kids Meal with any restaurant purchase of at least $10. Hot Dog on a Stick – They’re giving away a free turkey or veggie dog. Kona Ice – The company’s motto is “no taxation without relaxation!” so in honor of what they call “National Chill Out Day” they are offering free shaved ice from their trucks. Quizno’s – The sandwich chain is offering a 10.40 percent discount off any purchase to Toasty Points loyalty app members. Schlotzky’s – On tax day they’re offering a free small original sandwich with a purchase of chips and a medium drink. Sonic – Half-priced cheeseburgers all day. Tony Roma’s – From now until tomorrow, folks can get a free Kickin’ Shrimp appetizer with the purchase of any entrée.